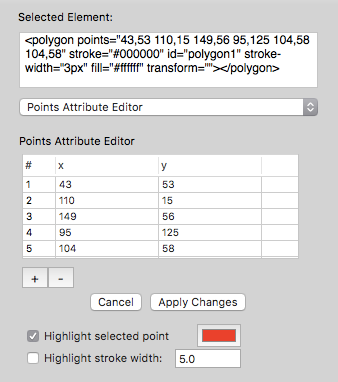 The Points Attribute Editor is available when creating or editing a <polyline> or <polygon> element. It has a table of points, with the “x” and “y” attribute values displayed in the table cells. The values can be editing by double-clicking a cell and entering a new value. Click the “Apply Changes” button to apply the new points attribute value to the selected element. Click the plus (+) or minus (-) buttons to add or remove a point. If a checkmark is set in the “Highlight selected point” checkbox, a red circle will be drawn around the point selected in the points table.